I am making myself quite crazy trying to figure out a work-around the earred-cap rear U-joint on my 1956 Dodge. I am NOT paying $450 for a U-joint thanks very much. So far, the best possibility would be to find a vintage Detroit cross-type U-joint (with the 0.579" shafts) and swap the earred-end caps from my existing rear U-joint. To do that, I need to find an appropriate PN for that Detroit cross-type U-joint. 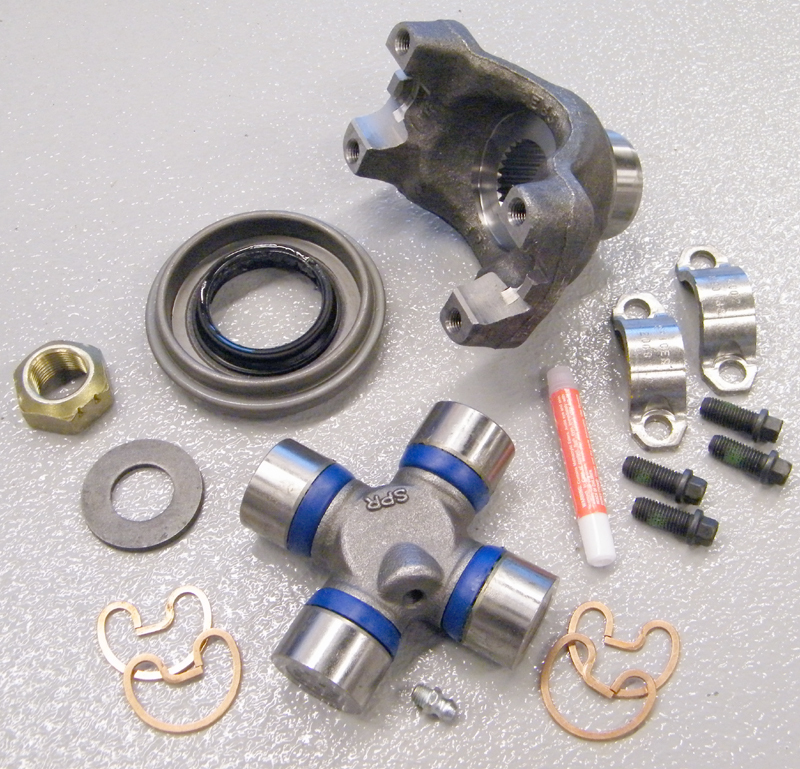 In the meantime, while looking at Mopar Mall's offerings, I see that their 58 U-joint kit has a normal cross-type U-joint. That means that between 57 and 58 the pinion drive flange design was changed. SO this gets my mind going. "What if I could swap in a 58 Pinion Drive flange?" - then I could potentially use a "normal" cross-type U-joint. 3. The pinion flange seal of the 58 drive flange would have to have the same outside diameter as my 56 pinion drive flange seal (so it fits in the diff housing). I have no answers to any of the above. Location: So. California What is the pinion spline count on the yolk for this rear axle? Is there a chance that you could swap the yolk with a later 8 3/4? That's where I would put my effort first. What is the pinion spline count on the yolk for this rear axle? Is there a chance that you could swap the yolk with a later 8 3/4? That's where I would put my effort first. At this point, I don't even know the spline count on my 56 Dodge rear pinion. I was hoping for a BTDT on both the 56 and the 58, not necessarily from the same person. When I do my pinion seal (or have it done), I will get at least the 56 info. Mostly hoping for somebody with 58 info. (I know nothing about 8 3/4" read diffs). Location: Muskego, WI This is just one of the reasons I update the rear end in my 1956 Imperial to a later Mopar 8 3/4 rear end. Readily available u-joints, brake parts (including drums), parking brake in rear axle (helpful for future transmission update), no more shoe adjustments, more readily available gear ratio options and so on. Location: Alaska Dave the 8 1/4 rear which is basically what you have was used in the 6 cylinder cars up until at least 61. You need to look for one of these to swap the yokes. Location: So. California I never knew that. It isn't used in the '60 Valiant or other A-bodies. They have the newer 7 1/4. Does a '58 Plymouth 6 cylinder not get an 8 3/4?? The '56 Plymouth doesn't have this funny u-joint, but instead uses another ball & trunion joint at the axle, so it's yolk is different still, even though it uses the same axle. I ended up swapping a B-body rear into mine for the simple reason that I wanted to change the gear ratio. It's pretty tough to find optional gears for that old axle - especially if you want 2.76:1 or a sure-grip with it. The '56 Plymouth doesn't have this funny u-joint, but instead uses another ball & trunion joint at the axle, so it's yolk is different still, even though it uses the same axle. Nathan: Not sure about 56 Plymouths but from what little I know about 56 Dodges, the ones with the 6 and maybe the small (270 poly) V8 got the small (3 5/8") spring-loaded ball and trunion U-joints at both ends of the drive shaft. The larger 315 V8s, got the 4" ball and trunion and the front and the hard to find "earred" Detroit cross U-joint at the read. I think your 56 Plymouth came with a 277 Hi-Fire V8 if I remember correctly so I wouldn't be surprised that it came with two ball and trunions. Location: So. California Only the Fury 303 had a larger motor in a '56 Plymouth. I wonder which joint they came with. I can compare to NOS Imperial u-joints I have. In that post, some one posts a link to the rear U-joint on eBay for like $450. No way, Jose!! Then I found and purchased a Moog 315G in the hopes that I could swap the end caps (normal for earred). Turns out that the OE shaft size was much smaller than the Moog 315G shaft so swapping caps isn't possible. That lead my to start my own rear U-joint thread with the emphasis on somehow being able to use the $22 Canadian Moog 315G U-joint. I think that it will fit in the drive shaft yoke, the issue is what to do at the pinion shaft. Location: So. California I doubt that u-joint is the cause of your clunk. If your bearings look good and you don't see (or measure) any visible wear, then I would clean it up, grease it, and put it back in. Your clunk most likely came from the front ball & trunion, something in your e-brake, or something in your trans. Of those, the ball & trunion is the biggest suspect. - Always start with "D" first of all, even if you need to go in reverse. - Wait until you feel that the gear is engaged. - Now press in "R" and you will most probaly not hear any "clank"
Location: Muskego, WI Checked my Imperial u joints. Same style, but much larger as expected. Sorry. Location: So. California Sven, what do the results of this test tell you? Dave the 8 1/4 rear which is basically what you have was used in the 6 cylinder cars up until at least 61. You need to look for one of these to swap the yokes. Yes. the 8 1/4" R&P lasted up into the sixties and the later yoke used the very common 7260 u-joint, so it makes sense to swap yokes to use the readily available 7260 instead of trying to find the original orphan u-joint. All 8 1/4" and 8 3/4" pinions prior to '69 had 10 splines so any 10-spline 7260 yoke should fit the pinion all the way back to '53; there might be differences in the pinion seal (early housing/late yoke) that require some creative searching. Sven, what do the results of this test tell you? When the car is parked, the transmission fluid will slowly drain back into the pan and the lines are practically empty. When the D is engaged, the line pressure will build up to 85-95 psi and the circuit will be pressurised. If R instead is engaged the line pressure will build up to 225-275 psi directly and this will cause a pressure blow that will result in a CLONK as the mechanical elements reverse the mesh. I guess the point is to swap the pinion flange to use e.g. the Moog G315-u joke instead of the very, very expensive u-joke with the ears at the pinion flange side. As Wizard stated, the clonk noise is from another source. In my 56 NY it's the same type u-joke. Few years back it got one from Andy Bernbaum. I assume it will be ways more difficult to get one of these u-joint as they disapper... Basically I would expect that the 57/58 8 3/4" rear end has that flange, because (when my NY was at Wizards) we realized that the 56 NY is basically a predecessor of the 57 8 3/4" rear end. Don't know if the same rear end (as in my NY) was used in high power 56 Dodge cars (D500?). Powerflite: Just to be "safe", I have found and purchased a NOS ball and trunion housing and also rebuild bits for it. So that end will be covered. In the meantime, I greased the existing joints and put the driveshaft back on. Wizard/Sven: Thanks for the "CLANG" eliminating instructions. You probably posted that before for somebody (or me) but your second post with the details and pressures drives is home for me. Tak. Dieter: Thanks for your comments. As far as I can tell, the 56 D500s (at least the non-race versions) used the same rear diff as the normal D6-3 V8s did (see below). I tried to access your photo album but failed. Something like this could be "Plan B"
Location: NorCal The pic above is not of a Detroit u-joint, it's a Spicer. The pic above is not of a Detroit u-joint, it's a Spicer. Thanks. Bought that 10 spline Yoke to further my investigation. Today I go back to check eBay and there is another one, cheaper, and with no grooves where the seal sits. Go figure. In either case, I will still need the caps and have no clue why they aren't included with the yoke. That one didn't use U-bolts. Those are blind threaded holes. Location: NorCal The 7260 strap and bolt kits are readily available from Mopar Performance, P/N is P4120468. Dorman and Help! also offer them but I don't have a number. Be careful, the 7290 straps look the same but the bolt holes are wider apart. 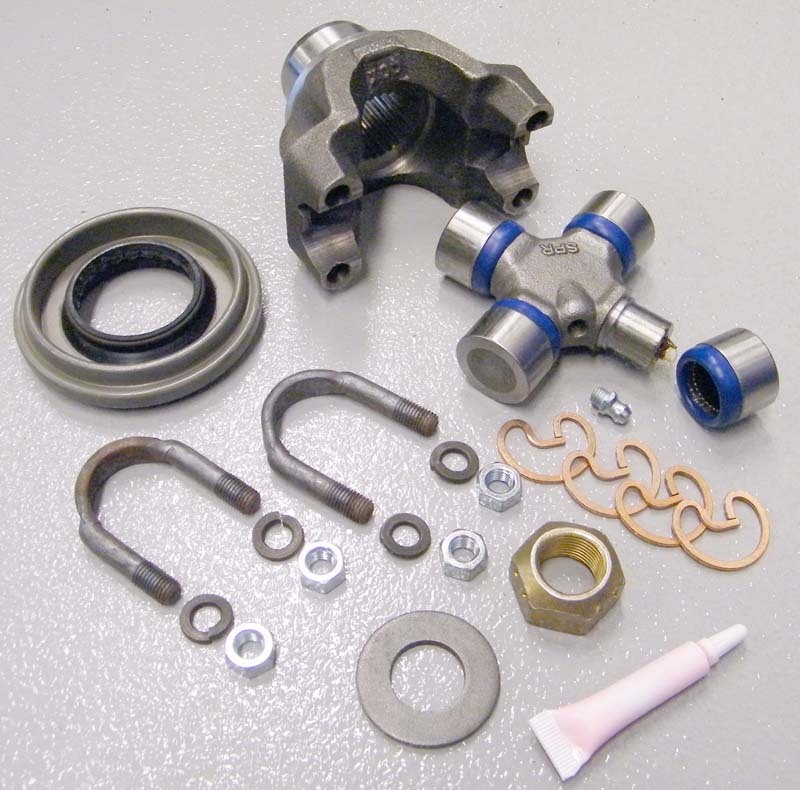 The 7260 strap and bolt kits are readily available from Mopar Performance, P/N is P4120468. Dorman and Help! also offer them but I don't have a number. "Mopar Performance U-Joint Strap and Bolt Package - P4120468"
Found a couple of local sources of aftermarket (Dorman) 7260 U-joint strap kits and in doing so, I bumped into an OE PN, i.e. 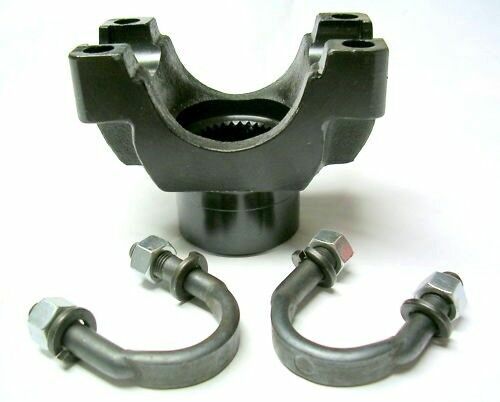 1828 824 for the 58 Dodge U-joint clamps. That lead to an eBay search where I found five of them for a real good price. I will only need two of them so I will have at least 2 available for somebody else that needs them. Also found some general 7260 versus 7290 information that will come in handy. Location: Lower Mainland BC That recent link to the 58 Belvie for sale included photos of the rear diff and how those straps hold the U-joint into the flange. My pinion flange isn't scheduled for delivery until Oct. 2 so I will have to be patient. That recent link to the 58 Belvie for sale included photos of the rear diff and how those straps hold the U-joint into the flange. My pinion flange isn't scheduled for delivery until Oct. 2 so I will have to be patient. Pinion flange yoke came in yesterday and I went down to pick it up (and few other things, like the OE U-joint straps). On my way home, I stopped by the "Rear Ends Only" shop and showed them the yoke, asking about the groove (see photo below). They said it was 50/50 that it would work with out leaking even with a new seal. They suggested that I need to get a speedy sleeve from (insert shop name here). So I left the read end shop and went to the second shop (Lordco in my case) where they were able to pick me a Chicago Rawhide (brand, no cows died for me) Speedy sleeve. Not cheap. CDN$52 plus taxes. Hmmm....Back at home I determined that I could buy a NEW 10 spline flange for a 58 Dodge equivalent with the 7260 UJoint for CDN$94 (I need to check the dimensions). Location: So. California Before you get too far, I would try it out and measure it to compare to your old one. Before you get too far, I would try it out and measure it to compare to your old one. I hear you but that is a problem. I probably can't get the pinion nut off with the car slightly jacked up (with jack stands) and me laying on my garage floor. BUT I will have to try. If I did get it out, then the question is, do I replace the seal right then or ?? In the meantime, here are some photos of the Moog 315G (equivalent to a 7260 "Small Dodge") U-joint sitting in my "new" 58 Dodge style pinion yoke with one end held in with a Neapco Strap (and bolts) and the other with an OE strap (and Neapco bolts). If this goes ahead, I will use two OE straps because they fit best (DUH). OE bolts were $9 each at the local Dodge Dealer so the four Neapco bolts and two straps for $7 or so was a deal. Also shown is the Chicago Rawhide Speedi-Sleeve ready to be banged on. (But I found out this afternoon that my NOS guy might have a NOS 58 Dodge pinion flange for not much more than the Speedi-Sleeve (which I would return)). Progress, but the end is not in sight due to the unknowns, etc. The pinion shaft sizes seem to be the same between the 58 style and my existing 56 style, i.e. 1.875 inches, which means a stock 663 602 seal should work. Location: So. California An air compressor and strong air impact gun makes this job very quick. They make electric impact guns now that aren't too bad, but don't quite have the impact that the air gun provides. But you could give one of those a try if you are adverse to getting an air compressor. I am realizing that I can no longer live without a sand blasting cabinet, so even though I really don't have the space to put one of those things in my increasingly crowded garage, I am going to get one and figure it out. An air compressor and strong air impact gun makes this job very quick. They make electric impact guns now that aren't too bad, but don't quite have the impact that the air gun provides. But you could give one of those a try if you are adverse to getting an air compressor. I have a small air compressor and air impact gun as well as an electric impact gun (but I can't remember what the maximum setting is). I don't know what the size of the pinion nut is but I am guessing larger than any impact socket that I own. All that said, I would be worried about chipping crown/pinion gear teeth during the impacting. But all that said, may be that is what I need to try. Location: Alaska Speedi sleeves are expensive but they will allow you to use a part that is grooved or slightly damaged without replacement. If as you say you can buy a new yoke cheaply, go that route. I have used speedi sleeves many times with good results, just be careful when installing. As to the groove in the yoke seal surface, it's not that bad, I'd run it as is. 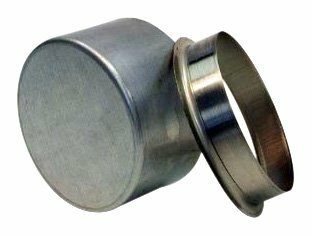 Speedi sleeves are expensive but they will allow you to use a part that is grooved or slightly damaged without replacement. If as you say you can buy a new yoke cheaply, go that route. I have used speedi sleeves many times with good results, just be careful when installing. Okay. Went to my NOS guy this afternoon. Picked up a NOS 58 Dodge 1828 644 rear pinion flange that I will keep and a NOS 57 Dodge 1738 748 Pinion Drive Flange for comparison that I will return to him Also bought a couple of SKF 18880 seals that are the modern equivalent to the OE 56 Dodge (and others?) 663 602 seal. The 1828 644 crossed up to a much later flange, i.e. a 3004 872, at least that is what my NOS guy said. Supposedly the same thing as a 58 Dodge 1826 644, just a newer NOS PN. I will call it an 1828 644 to be consistent. Both it and the 57 1738 748 seem to have the same key dimensions, i.e. the distance from the 10 spline end of the flange to the "bottom" of the U-joint bearing cap seat. The 18880 seal for my 56 Dodge fits the 58 Dodge flange, so that is another hurdle crossed. I think it is going to be a "Go with Flaps up"!! 3. The OE 56 Pinion seal 663 602 (now an SKF 18880) fits the nose of the 58 flange (same diameters). All of which seem to say, this should work. Location: Lower Mainland BC Before I return the OE-style earred U-joint that I recently got from an well known supplier as "New Old Stock" (complete BS, you can see where it had been bolted to the OE flange and besides, that is more than "shelf dust"), I decided to check the diameter of the end cap that sits in the end of the driveshaft. What I measured (with a MAC tools digitial caliper) was 1.0795. Then I measured the Moog 315G that I hope to be able to use in the 58 10 spline flange and got 1.0785, so I think we have another winner. This is NOS??? I think not.